In 1967, Agnes Martin left New York to live off the grid and eventually settled in New Mexico where she remained until her death in December, 2004. In New Mexico she lived humbly with few possessions and little human interaction. Such sparsity in her life was reflected in her work. “Agnes Martin, ten prints” showcases some of her iconic minimalist work with a series of 12 by 12 inch framed lithographs from 1990. 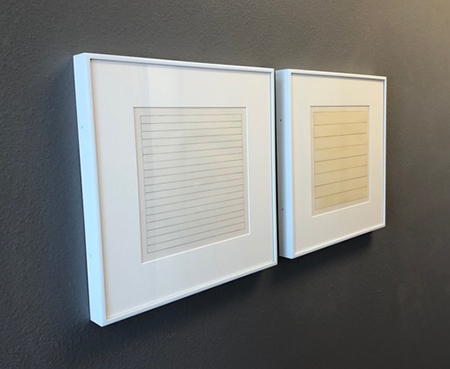 Each of the ten pieces is formatted within a square, some containing grid-like patterns, while others are composed of thin, horizontal lines which were originally done in graphite. Martin’s work is initially challenging. We are so used to seeking information in grid forms and lines, but the grids in Martin’s work are simply squares and rectangles, no information is to be gathered. Though precise, the lines waver slightly in exactness and pressure, allowing us a small interpretation of the artist behind the work. Yet they are still austere, and while aesthetically pleasing, they offer little initial emotional connection. Once you realize that the prints are not meant to be anything other than what they are, it is easy to become absorbed in their beautiful simplicity. They aren’t complex or hiding some secret form; they are meditative and elegant. Martin once said “My paintings are about merging, about formlessness … A world without objects, without interruption.” The moment we stop trying to make Martin’s work something more than what it is, that moment we may be immersed in the work as she created it.